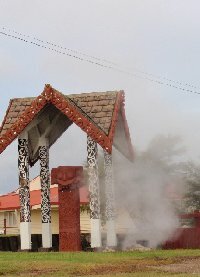 If you're staying in Auckland New Zealand you should really travel down south to Rotorua for a day trip or weeken getaway spent in this Maori paradise. 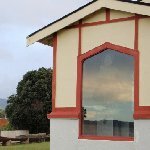 Rotorua is probably the place where the roots of the Maori people and the traditions of New Zealand are best preserved and besides all kinds of galleries and shows to visit there are some beautiful tourist attractions as well. The best known would the thermal hot springs in Rotorua and of course the Government Gardens. 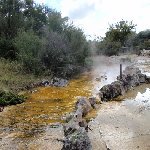 The geysers and bubbling mud-pools are a local drawcard and many people come to Rotorua to see for themselves. 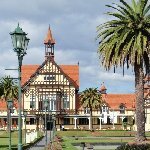 The public Government Gardens Park is located by Lake Rotorua and houses the beautiful Rotorua Museum of Art and History where you could soak up some more culture while in New Zealand! 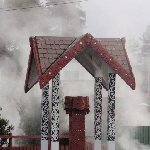 Did you enjoy Day Trip to Rotorua from Auckland and have you been on a holiday in Rotorua, New Zealand? 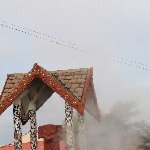 Where to eat in Rotorua: Lovely India, great curries!